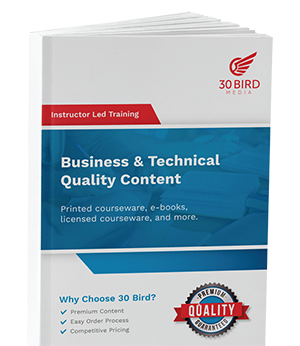 The 30 Bird Media team is here to meet all of your technical and business learning needs. Whether you’re after printed manuals, E-books, or licensed courseware, we have what it takes to take your training to the next level... without breaking the bank. And we back it all up with unparalleled customer service. Contact us today to find out what 30 Bird can do for you!